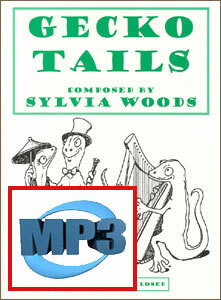 These products are mp3 audio track downloads of music from the Gecko Tails suite by Sylvia Woods. This 12-minute suite of five original, whimsical compositions by Sylvia Woods was inspired by the cute little geckos that live in most of the houses of Hawaii. With their suction-cup toes, these symbols of good luck climb the walls and dance across the ceiling. Save money by ordering all of the downloads together for $3.95. The individual tracks will be zipped together in one file. Or, you can order a PDF download of the Gecko Tails book, instead. The PDF download INCLUDES all of the mp3 tracks, as well as PDFs of the music in the book.